The California Department of Fish and Wildlife (CDFW) and the PFMC Groundfish Advisory Panel (GAP) has proposed some additional Catch Share Plan (CSP) alternatives for the PFMC to analyze this fall (also see Tom’s summary on page 4). At the upcoming September 11-18 PFMC meeting, the council will consider potential CSP alternatives to analyze in the next two months, for consideration at the November 13-20 PFMC meeting. Below is a summary of information leading up to the September 11-18 PFMC meeting, as well as a summary of HASA’s feedback to CDFW on the potential alternatives. Changing the CSP to something that is better aligned with the “fair and equitable” requirements of the Magnuson-Stevens Act has been an effort that HASA has been very involved with over the past five years, with some success, but still more progress is needed. We are hopeful that the PFMC will choose to evaluate and ultimately adopt a CSP that provides a fairer distribution of Pacific halibut allocation to California based on our contribution to overall biomass. We have been clamoring for a greater portion of the Area 2A Catch Share Plan pie for many years (Area 2A is California, Oregon, and Washington). We used to be at 1% of the non-tribal allocation, now we’re at 4% (34,580 lbs for 2017), and we’d like to get at least 40,000 to 50,000 lbs to enable a full sport season in the future, which is probably around 6% of the non-tribal allocation depending on what the allocation is from International Pacific Halibut Commission (IPHC) on a given year. The 4% of non-tribal allocation translates into 2.6% of the total Area 2A allocation (includes tribal allocation). A recent summary analysis by the IPHC estimated that California provide 10% to 12% of total Area 2A Pacific Halibut biomass (over 26” length). Compare this with a 2.6% allocation to California, shows that we’re only getting ¼ of the production value that California is providing to the overall pie (we think this is pretty unfair). The PFMC is undergoing a review of the Catch Share Plan for 2018, with initial alternatives discussed at the June meeting, a finalization of alternatives to be evaluated at the upcoming September meeting, analysis by NMFS between September and October, and adoption of a 2018 Catch Share Plan at the upcoming November meeting. At June PFMC meeting, at Tom’s great personal effort, the Groundfish Advisory Panel (GAP) recommended that one of the alternatives to be evaluated is an increase in California allocation from 4% to 6% of non-tribal allocation, being supported by a 1% reduction in Oregon and Washington sport allocation. The reduction from Washington would be less painful to them because it would come out of the sablefish bypass allocation; however, Oregon sport anglers would feel this 1% reduction. None of this increased allocation to California would come from the coastwide commercial sector. Also at the June PFMC meeting, CDFW proposed an alternative to increase California from 4% to either 7.15% or 7.51% of non-tribal allocation. In contrast to the GAP proposal, the additional 3.15% or 3.51% would come from the coastwide commercial sector only (none from Oregon or Washington sport). This alternative also proposed that California would manage its commercial fishery outside the coastwide commercial sector, and the 7.15% or 7.51% allocation would provide for both sport and commercial in California, and that California would manage that allocation. So this 7.15% or 7.51% sport+commercial allocation to California would be an improvement towards the 10% to 12% total biomass, but would now lump in commercial with sport allocation management. 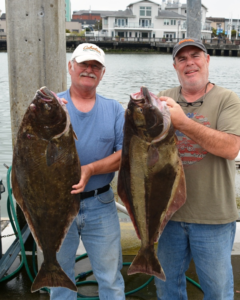 Last year, instead of tens to hundreds of pounds of commercial catch, the California commercial fishermen landed 1,259 lbs of Pacific halibut. This year, with the loss of salmon season, there is rapidly growing commercial effort targeting Pacific halibut, and in just a few days this year, they harvested 5,000 lbs. At this time, it doesn’t affect our sport quota since this commercial harvest is coming out of the coastwide commercial allocation (a 265,000 lbs pie in 2017). However, with the current CDFW proposal, it would shift management and accounting for both sport and commercial harvest to CDFW as follows: a) first 30,000 lbs of California allocation goes to Sport, b) if California allocation is less than 40,000 lbs, all would go to sport, c) if California allocation is greater than 40,000 lbs, then anything over 30,000 lbs would be split equally between sport and commercial. For example, if there was 37,000 lbs allocation, all 37,000 lbs would go to sport. If there is 42,000 lbs, 36,000 lbs would go to sport and 6,000 lbs would go to commercial. There was concern from the commercial anglers about this split because the commercial fishermen would have received nothing in 2017 under this approach, whereas they are currently getting much more than that now under the status quo. Also, there was concern about grouping the commercial and sport allocation together, as it would potentially cause friction between the sport and commercial sectors. We agree with and appreciate the argument made by CDFW to the PFMC (based on IPHC analysis) that the current Catch Share Plan is unfair to California given the California contribution to overall Area 2A Pacific halibut biomass. We support evaluation of the GAP alternative (increase allocation from 4% to 6%, where the additional 2% would come from the Oregon and Washington sport allocation). While slightly less preferred due to anticipated objection from the coastwide commercial sector, we would also support evaluation of the 2% coming from an equal split from Washington sport, Oregon Sport, and coastwide commercial (0.66% from each) to reduce the pain on any one sector. We prefer to keep the commercial fisheries management as status quo (not combine with sport allocation) to avoid potential future conflict/competition between the recreational and commercial sector. We can support evaluation of the CDFW alternative provided that the California commercial isn’t combined with the California sport allocation. Given our preference of maintaining the status quo of the current California commercial sector, we’d also recommend that the 3.15% or 3.51% of additional allocation be evenly split between the Washington sport, Oregon Sport, and coastwide commercial (1.05% or 1.17% from each) to reduce the pain on any one sector. Given the larger percentage change with this alternative (3.15% or 3.51%) compared to the GAP alternative (2%), it is probably better to have this split between all three sectors rather than just Oregon and Washington sport allocation.